The first refrigerators made their appearance in the late 1900’s. Half a century later, in 1951, the first patent was processed that condensed the power of the fridge into a portable icebox. Since then, the technology of the cooler has been refined to a point we can pull out an ice cold beer from a box after 7 days on a boat. These resilient ice chests have been coined with the term rotomolded. And, the company called Yeti had for years turned into the stable for reliability in this new order of the faithful icebox. Naturally, coolers like Yeti soon made their appearance. However, the competition on occasions followed the deceptive path of knock-off brands. That brings up the question, similarly with every product flooding the consumerism of our cities, how can you avoid the pitfalls of buying a knock-off brand its unreliability will make your writhe and raise your hands in the sky seeking validation you haven’t committed a crime in your past life? The plethora of reasons the old-fashioned icebox has faded into obscurity can be condensed into one. The rotomolding process from which Yeti coolers and other cooler alternatives are born gives them an advantage. We are not going into detail on how this process comes about, other than it involves the transformation of thermoplastics. Everyday moments are packed with products impregnated with the benefits of rotomolding. The persistent traffic cone, the helpful and often pungent garbage bin, the house your dog lives in… All these products have in common an unparalleled endurance. A trait appreciated as much by the seasonal fishing enthusiast as by the manufacturer, since the process drops expenditure. Someone would say a win-win situation. From their consistency emerges a stubbornness to resist the harshness of tough terrains. They can even be used as a raft if the circumstance arises. The construction of Yeti coolers and other cooler alternatives also allows them to retain their temperature much longer than their regular counterparts. Some brands have been tested to stand their ground for 10 days to avoid the dismay of your beers swimming in a pool of melted ice as the landscape vistas open up in front you. Their ice retention is prolonged by an additional 2-inch insulation. Of course, you can always add hours by using large chunks of ice. Also, camping at the feet of an active volcano, or even in the feverish heat that extends 110 Fahrenheit degrees, should adjust your expectations. Allowing warm air to mingle with your ice will hasten its transformation from solid to liquid. And, opening the lid for no particular reason will result in wet scenarios. The ice retention will extend if you pre-chill your cooler using a sacrificial ice bag. It is important to remember that your wrongly named coolers are built to retain temperature, whatever that is. Although the technology wasn’t their invention, back in 2006 two brothers from the depths of a basement envisioned the evolution of the icebox. Their dominance in the market using the rotomolding process to provide for high-end coolers bolstered them in the leading spot of the race, making the Yeti cooler a coveted item amongst outdoorsmen all across the country. Long has been 2006, though, and with the growing demand reliable competition was a concomitant. Don’t get us wrong. Yeti coolers still glee most outdoor enthusiasts. However, as with any company that stayed at the top for a moon too long, their products come in excruciating prices (*cough* Apple). The emerging brands offer similar alternatives to Yeti coolers with sometimes even better features, and their pertinence in the ever-evolving game of iceboxes is jolted by their friendlier price tags. Cheaper and on occasions better, these brands no longer follow the footsteps of their predecessor. They have evolved beyond them. While in their basic functions all of these types of products (the Yeti cooler, Grizzly coolers, RTIC coolers and many more) are triumphant in comparison to regular iceboxes, they are not perfect. The mere fact that they carry additional features implies extra weight. In extreme heat, dead-lifting 60 pounds of ice and thermoplastic can strain the most athletic of builds. And, the old method of drag and pull will wear off the base. Of course, unless you are a lone wolf, your fishing crew will make the transport from car to boat easier. There is also the matter of price. The brands after Yeti’s success come in a discount, yet most of them still have 3 digits on their label. Common coolers usually demand from you half the lolly than rotomolded iceboxes. Now, the additional cost shouldn’t be a source of infinite dismay rather it should require a shift in perception. They are an investment that promises to outlive you and in most cases come with a lifelong warranty. An informed choice must always include your relevant needs. Take the occasion of a beach excursion in the company of a few friends in contrast to a weekly trip marveling canyons. The capacity of your rotomolded will vary in accommodating the different situations. As a measuring unit, coolers use quarts. The rule of thumb is a 20 quart cooler will hold up to 25 cans, depending on the ice you will feed it. Of course, given that these heavy duty boxes will stay young as you grow old, unfolding your future needs denotes fewer expenses. Maybe buying an order of magnitude larger than 20 quarts will come in handy. The fact is coolers are traveling companions. It will be a pity to buy one and discover the trunk of your car disagrees with its size. Your evaporating merriment will be felt by your bank account. Ensure, then, the measurement of your trunk, boat, or any kind of space the cooler will take correspond with its specs. Remember, the best cooler is the one that fits your needs. As your ice box gets heavier with every liter of ice you add, its transportation becomes a trickier task. The design of the handle most styles have allows the cheerful vacationist to offload his truck without blistering his hands. The insulation provides an added layer for retaining temperature. Of course, the amount of insulated space will correspond to the level of retention your cooler can offer. There are some coolers that have their innards covered in totality with foam-based insulation. There is, however, a slender possibility your product is delivered defective. You can check the strength of the insulating layer with a flashlight. Enclose the artificial glow in the cooler and in the dark observe if it escapes from the icebox’s surface. Any signs of rounded light spots are not benign. It is not surprising most modern iceboxes have added to their design a drain plug. It directly feeds into the need of a tireless end to a tiresome excursion. You might be tempted to employ the ease of draining water while on your fishing trip. Resist the temptation. The voluminous cold water requires from the environment more energy to warm the contents of your icebox. It, also, takes any shape to accommodate the drinks and food in a cold pool. Unless anything is endangered by getting wet, keep the water. From the overflowing pool of rotomolded coolers (and those who claim to be) we took a deep dive and emerged with 5 alternatives to Yeti coolers that would imprint a smirk on your face. The innovative Pelican, the stalwart Grizzly, the utilitarian Engel, the economic Igloo, and the competitive Orca have an edge in their own right. Let’s deconstruct each brand with one of their stellar iceboxes with this handy cooler review. You are probably aware of Pelican products as they have been a dominant force for a few decades in the market. What might have escaped your grasp was how the company has surpassed Yeti in the rotomolded cooler competition. The Pelican Elite line is built to last a lifetime, although the claim seems to omit how many lifetimes. This 50 quart behemoth will most likely serve under your grandchildren. The latches of the Pelican play in a league of their own. Their interlocking and easy-to-use features cement the security of your lid and longevity of your ice. And despite its size it only weights up to 31 pounds, which makes its transport easier in the hands of two. The Elite cooler will most likely find a home in avid fisherman’s boats and the trunks of perpetual vacationists. If you are looking for the ultimate alternative, the Pelican ProGear 45QW Wheeled Cooler, with 45 Qt capacity, comes rolling in with a price tag of just under $400, a 10 day ice retention rate and 37.25 pounds of empty weight, compared with Yeti’s Tundra 45 Haul Wheeled Cooler at a slightly higher price with its 10 day ice retention and 37 pounds of empty weight. So, for a slightly lower price, the Pelican ProGear offers the same benefits of the Yeti cooler. We are dropping lower on the capacity to exemplify the potential of a personal icebox. A compact miracle, the Grizzly cooler stems out from one of the forerunners in hunting, fishing and everything relating to outdoors activities manufacturer. The indestructible nature (tested by 11,999 lb tractor) of the Grizzly 15Q is not its selling point. Rather, it was built with the friendliness of use in mind. The measly 11.25 pounds of weight these Grizzly coolers brag about are balanced with a shoulder strap that will make your private expeditions a breeze in the path. 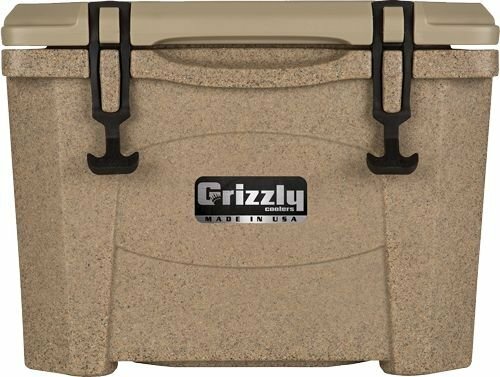 You can load the minute Grizzly coolers with a 12 pack of beers and will last for approximately 4 days, which is a lot more than a single trip to your nearby beach requires, and more than the Yeti Hopper. One of the highest rated compact coolers in the market, the Grizzly 15Q will also be adored by the family barbecue reunion at the 4th of July, fireworks painting the noon. Hands down, this cooler alternative will be one of the best lunchboxes you will ever carry. With so much to offer, it’s no surprise that Grizzly coolers come high on this list and more than one cooler review. Doesn’t have a drain plug. However, for such a compact size, draining water is much easier even without a plug. We are entering the realm where products of high quality come in the cheapest package. Igloo grew from a modest metalworking shop in 1947 into an industrial giant that refined the term ice chests. The familial recreational outings in the summer months will greatly appreciate the traits of the Igloo Sportsman. The class cooler adopts a white exterior, which in combination with UV inhibitors enables its ice retention abilities. A self-stopping integrated hinge on the lid eases opening and closing and minimizes exposure to the sultry elements. In comparison to the counterparts of its caliber, however, the Igloo fades when it comes to keeping the ice solid. If you can put aside this discrepancy, for a mere 168 dollars you could have a robust cooler for any kind of family adventure. On the other hand, the Igloo Yukon 50 Qt offers a 7 day ice retention capacity with a 29.4 pound weight and an approx $277.99+ price tag, compared with Yeti Tundra 50 Qt, which offers a 10 day ice retention with a 26 pound weight and an approx. $379.99+ price tag. A side-by-side cooler review will show that, if budget is the priority, the best alternative to the Yeti Tundra is clearly the Igloo Yukon. Engels was one of the first companies that stem out in the rotomolding cooler market. Little known fact, they were the inventors of the process underlying all the coolers you are shuffling at the moment. However, they didn’t stop there and have been refining their game-changing technology ever since in hopes of creating the best cooler alternative for the outdoorsman. The Engel 35 is one of their flagship products for camping trips and fishing. The spacious ice chest can hold up to 42 cans or 40 Lbs of water and has its totality insulated by 2 inches of polyurethane to retain its temperature for 10 whole days. In comparison to the Yeti that’s an added 2 days. The marine grade compression latches are easy to operate. While the Engel doesn’t compete with the added features of the Pelican, the utilitarian design will be adored by the practical vacationist. The Outdoor Recreation Company of America, alias ORCA, alias the most mirrored company to Yeti, prides itself for creating great American products for the outdoor enthusiast, and are a great cooler alternative. Now, whether their American-made promo holds any effect is purely up to preference. What makes the 40 quart caliber ORCA coolers come so close to their Yeti counterpart? The two coolers side to side will only cause confusion because of their brand signs. The latches are the same T-Rex shape. The handles have similar flexible structure. And, even their price fluctuates on the same range. Of course, keeping up with the trend of providing your beers a better alternative for a cooled cave than the Yeti, the ORCG040 has climbed the top of the ladder for ice retention. If your idea for a hunting trip reaches its summit at fortnight, then this 40 quart treasure box will surely last the while. With such similar features, ORCA coolers surely stand their ground against Yeti coolers. Plus, the ORCA 20, the small ORCA coolers with 20 quart capacity for the day adventurer, weigh a mere 16 pounds, compared with the Yeti Roadie, which comes in to 18.9 pounds. In this case, the slightly heavier Yeti Roadie is a disadvantage, as the smaller models are made to be as portable as possible, so an extra weight of nearly three pounds puts the Yeti cooler behind Orca coolers. We get it: not everyone is looking for the massive Yeti cooler. Sometimes, even the small Yeti Roadie, the “carry-on” version of Yeti coolers, is too big of a hassle. The soft side of coolers is usually reserved for people with lesser needs. The idea of heading to the hills for a week to camp around a fire and chant horror stories is not alluring to everyone. And, going for a few hours to the beach carrying a 40 pound beast will taint those idle moments under the welcoming sun with listless regret. In these cases, the marine cooler is not for you. Here enters the soft cooler. Also, the rules shift in the absence of the rotomolding process. The ultimate goal of the cooler is not to reach maximum ice retention, rather to provide enough comfort. And, as the general use of the softer version is enjoyed by fewer people, their storage capacity for things other than ice comes into place. The less baggage you have with you the less anguish you will face as the trip back to the car commences. The Engel line for soft coolers follows the trend of welding seams to dramatically increase the longevity of your ice. The added film of thermal plastic urethane provides extra coverage and protects your precious little icebox from being punctured by sinister homeless nails. That’s a blessing as the HD30 come in a 3 digit price. It still is half the lolly the Yeti Hopper will require. Its capacity to hold at least 25 cans is measured against its ability to control temperature efficiently for 4 days. Despite, though, its undeniable innovations the Engel alternative still doesn’t match the versatility of Coleman. The biggest difference in the IceMule soft cooler is the absence of a zipper. If you count the welded seams, it implies this little wonder can float. We hope that you will never need to test that ability, but knowing it’s there does no harm. The way this ice chest is built allows you to roll it up and store it virtually everywhere. Even though it doesn’t meet the ice retention of the Yeti Hopper, the 24 hours it provides are more than enough for the lone traveler. With tons of color options, soft RTIC coolers like the RTIC Soft Pack 20 offer an affordable alternative for those with simpler needs. The RTIC Soft Pack 20 comes with 20-can plus ice capacity, more than enough for an afternoon fishing, welded seams, and a durable exterior for your outdoor adventures for years to come. These RTIC coolers promise up to 5 days of ice retention and no leaks. All things considered, RTIC coolers are an alternative to keep in mind. The size of the icebox will inform its price. Knowing for what reason for its use will, in turn, calculate the size. Ask yourselves, “where will I take it?”, “With how many things do I plan to stuff it?” “How long will I need it on ice?” Once you are able to answer these questions, you will be a step closer to finding an ice cooler that matches your needs. Always check the comments for the product you are considering. Chances are there will be a cooler review that matches your needs or comes close to them. Remember, your needs should dictate your purchase. There are many options to fit your activities. If you are looking for something that is easy to move around, consider wheeled alternatives to the Yeti Tundra like the Pelican ProGear. Smaller models, like the Yeti Roadie, find their competitor to be not only cheaper, but also lighter, like the ORCA coolers with 20 Qt capacity. If you are worried about being mauled by a bear, there’s the trustworthy Grizzly cooler; Grizzly coolers are heavy-duty coolers with a lifetime guarantee. If, however, you are looking for small soft coolers, may I remind you of the RTIC coolers, in this case the 8-can capacity model with an affordable price tag of just over $30. Finally, pay it forward. Once you get your brand new cooler, share an honest cooler review so that others can begin their journey to the cooler of their outdoors dreams. With hand too cooler, the best Yeti cooler alternative is the Pelican. Its additional features, from the interlocking latches to the ergonomic handles, separatse it from the herd. And, In monetary terms, you will buy a cheaper alternative to the Yeti cooler with better quality. Do they all come with a lid / hood? Rotomolded coolers always come with a lid. It is an imperative part of the process that enables the time of ice retention to stretch. In fact, most iceboxes in this category reinforce their lids with silicon at the periphery to minimize exposure to the elements. Soft coolers are predominately dressed with nylon. The durable synthetic shell commits against tough weather conditions and protects your portable ice chest from acquiring a few strategic holes. As we said above, if your idea of a cooler includes a few hours of personal use then the softer version would be a better fit to your needs. The marine cooler is fit for heavy use and tough external conditions, and it comes with a heftier price tag as a result. Ultimately, this cooler review is meant to help you hone in on your specific needs so that you find the right cooler to match your adventures.